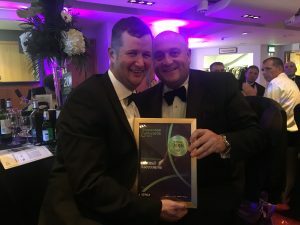 The Racecourse Association (RCA) is delighted to announce that Cartmel Racecourse has scooped the Racing Post Readers’ Award at the ninth annual RCA Showcase & Awards. Held on Thursday 8th November, the Showcase & Awards, partnered by Moët Hennessy, Racing Breaks, Racing Post and Great British Racing (GBR), celebrate excellence and innovation in racecourse customer experience. Across a sparkling awards night at Aintree Racecourse, there were a total of 15 awards handed out by special guests Sam Quek MBE and Katie Walsh. Cartmel Racecourse collected the Racing Post Readers’ Award, the only Award to be nominated by racegoers. Cartmel’s excellent customer service was recognised with the racecourse receiving over 300 submissions in addition to the winning one.